National Strawberry Month takes place in May. Strawberries are fun and colorful and a favorite among the young crafting set. Whether it’s cupcakes or garden rocks or anything in between, there are plenty of strawberry crafts and recipes for you to try! 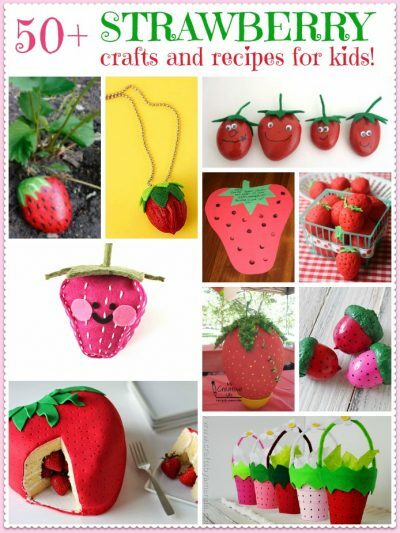 Here are 10 of our favorite strawberry crafts. You can see all 50+ here. 1. Strawberry Surprise Cake – This cute strawberry cake has a surprise inside… strawberries! Kids will love creating this cake and cutting to reveal the surprise inside. 2. Strawberry Sugar Cookies – Make sugar cookies that look like real strawberries. This easy recipe is fun to make and tastes yummy. 3. Strawberry Acorn Magnets – Painted acorns look just like little strawberries. Add magnets to make adorable refrigerator magnets. 4. ‘You Are Berry Special’ Card – Kids of all ages will love making a card for that ‘berry’ special someone in their life! It’s wonderful for Mother’s Day, Teacher Appreciation Day and many other occasions. 5. Strawberry Necklace – Turn a walnut and some felt into an adorable necklace. Be prepared for lots of smiles when you wear it! 6. Strawberry Treat Cups – Fill these darling treat cups with goodies for a strawberry-themed birthday party. Or use them for afternoon tea time with friends, real or imaginary! 7. Strawberry Rocks – Paint rocks to look just like strawberries. When you put them in your garden, they keep the birds away from your actual berries. 8. Strawberry Piñata – With its balloon-like shape, a strawberry is the perfect design for piñata-making beginners. It’s great fun for a party! 9. Strawberry Felt Cushion Toy – This cute little stuffed strawberry is an excellent project for kids who are learning to sew. It doesn’t take too long and provides lots of stitching practice. 10. Strawberry Tablecloth Holders – Turn rocks into cute strawberries to take along on a picnic. They’ll hold a blanket or tablecloth in place on a windy day. 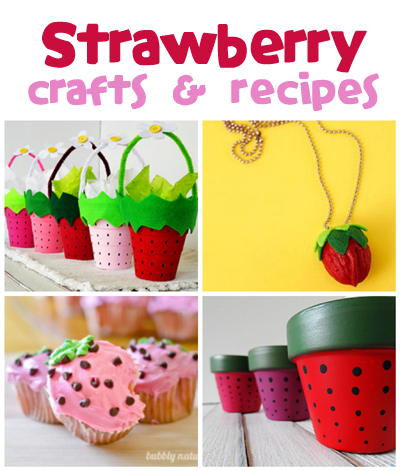 Be sure to check out all 50+ strawberry crafts and recipes! I LOVE ALL OF YOUR CRAFTS AND RECIPES! THEY ARE GREAT! THANK YOU SOO MUCH FOR SHARING!! Thanks Darlene, we love providing them!